Chyna has been at the Almost Home Animal Rescue League for 3 and a half years – such a long time – let’s try and find her a great forever family so she can finally have a place to call home. Chyna is approximately 6 years old and 65 pounds. She was brought into the rescue after being found tied to a fence over 3 years ago. She came in extremely fearful but has made great strides in becoming a more confident and trusting dog. She’s gone through obedience and socialization classes which have helped her overcome her fear and anxiety. She’s doing so well now that the rescue decided it’s time for her to find her forever family. Hi there! My name is Chyna and everyone says I am a beautiful girl with my one quirky ear that can’t decide whether to stand or flop over! When I came to Almost Home 3 1/2 years ago an Animal Control officer found me when I was tied to a fence by boys who were poking and hitting me repeatedly with a stick. I was terrified, and as a result I have been working very hard in our Training and Socialization program to overcome fear and anxiety with strangers (particularly with males). And, guess what- the program is working because the trainers feel I am ready to meet my new family and go home to start my ‘happily ever after’! I am also learning to be more balanced around my fellow furry friends, so that I can live with other dogs in harmony. So, here is a little more about me: I’m a big sweetheart! I love to give kisses and I get very, very excited when people talk to me! I really enjoy going on walks, and I have learned to be excellent on a leash. If you invite me to sit with you, I love nothing more than cuddling- and, of course, the kisses. I am very polite and won’t jump on you, and I know basic commands- like “sit”, “stay”, and “leave it”. Plus, I am potty trained. I am friendly with women, men and would be best with older children. My goal is to please you, so if I sound like a good match for you then please come and meet me at one of our training classes, where we can walk together and you can see how good I am! (Plus, you may learn some new skills as a dog handler!) Oh, and one more thing: my adoption includes an in-home first day introduction and training session by my trainer- this also applies to anyone who may want to foster me! I just need a home and a yard to live out the rest of my life with somebody to love, who loves me back. If you would like to give me my second chance at a happy life, please fill out an application and come meet me! 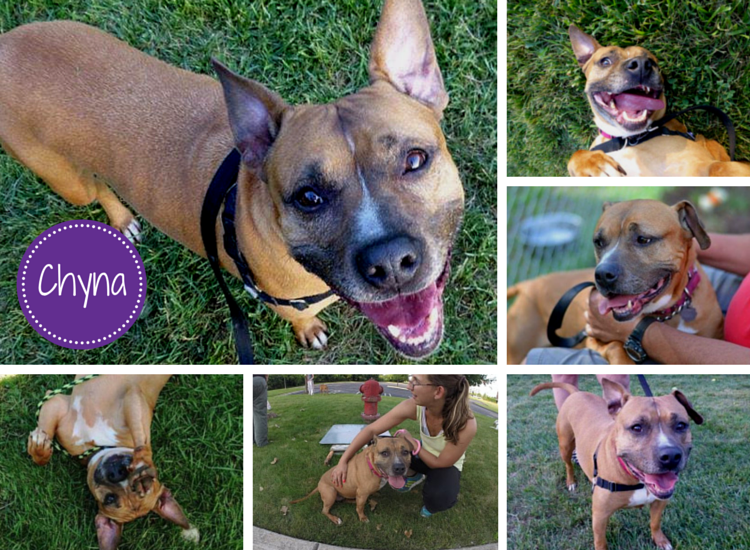 Chyna is a shelter staff favorite because she’s such a sweetheart and has excellent manners. She absolutely loves going for walks and getting belly rubs. If you’re interested in Chyna you can fill out an application from Almost Home Animal Rescue League. 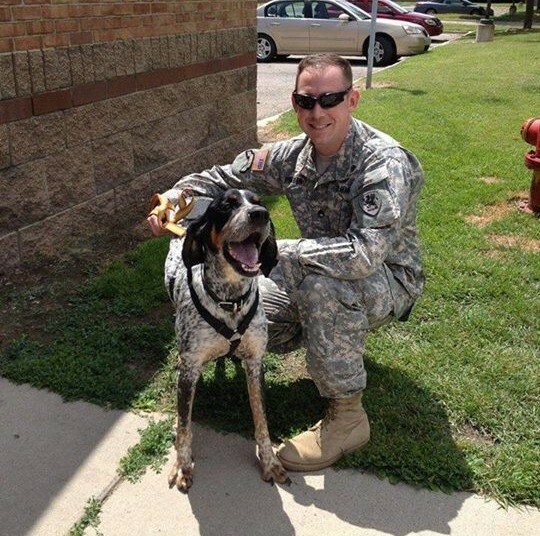 Love seeing these dogs smile; I think they know when they’ve found great people – their smiles tell it all. 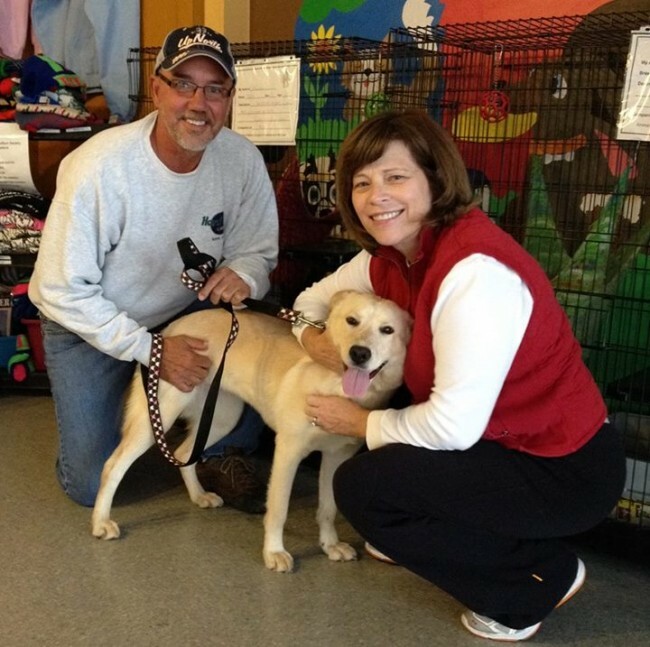 Would you like to see more photos of dogs smiling after being adopted? I’d love to post more if there’s interest. Please let me know in the comments if you like the idea. 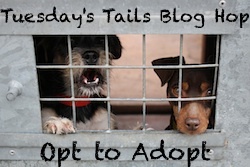 The Tuesday Tails Blog Hop is hosted by Talking Dogs and Dogs N Pawz. 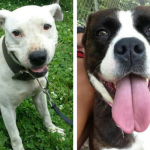 This is the blog hop that features adoptable shelter pets. Help spread the word about these great animals in need and let’s work together to find these animals a loving, forever home. Chyna is such a cutie! 3+ years at the shelter? Makes my heart ache. That’s way too long! I’ll be sharing her. Just my opinion, but I’d love to see a blog post devoted to adoption smiles. 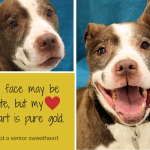 And it really would be a great post (each week or however often you’d care to post it) to link to this bloghop – in addition to your featured adoptable dog. A lot of the dogs I feature are at “kill” shelters and I purposefully do not look to see if they’ve been adopted. Can’t take the heartbreak anymore. Some are long termers at no-kill facilities and that’s another form of hearbreak. Chyna isn’t overly fond of men, which I think has a lot to do with it. It takes her a long time to warm up to them still – but she’s made a ton of progress. I still don’t understand how a dog like her has been there that long, though. I love doing the adoption smiles, makes me happy to share something good. It’s really tough going back to check on previous posted dogs – I do know 3 of the ones that have been posted here are in homes – I wish I had photos to compare those. It really is just heartbreak when you see ‘no longer available.’ I can’t stop thinking about lovely Carley – 7 years! Oh I’m so happy for Koda, it’s so nice to see them find homes. Well thank goodness for places like Dogwood helping those dogs. Chyna has such a sweet and happy face. We know her family is out there and we will share her. gorgeous gorgeous!! Poor sweet pup 🙁 Sharing! 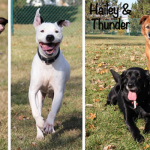 I like the blend of adoptable dog story with adoption success story. It helps remind us that everyday there are good people doing great things in the name of animal welfare and pet adoption. Hope Chyna finds a similar success soon. 3 years is a long time to be in a shelter. Yeah it’s nice to know all the hard work of shelter staff/fosters/volunteers/advocates can work and make a difference. It’s so easy to get discouraged when we forget to remind ourselves that there have been many successful adoptions. More than 3 years?! That is INSANITY! Look at that gorgeous smiling face! 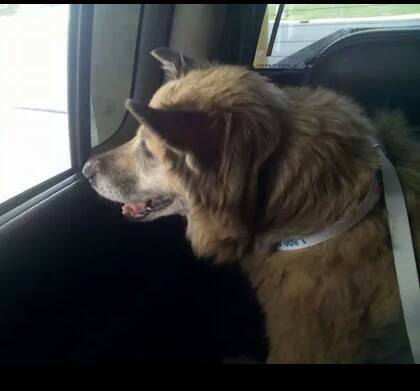 Sharing her – paws crossed that Chyna finds her forever home very soon. Working in rescue, I have seen lots of dogs with a fear of men be adopted successfully…I sure hope this will be the case with Chyna. Chyna is beautiful! Can’t believe she hasn’t been adopted yet. 3 years is too long to be at the shelter! I love the adoption smiles and I agree with Sue about a blog post devoted to adoption smiles! What a great topic to post about!!! 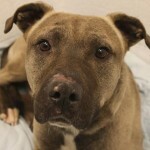 I hope Chyna finds her forever home fast, now that she is ready! Sharing her! Hope Chyna finds a good home.